Okay, they say a picture is worth 1,000 words, but sometimes a picture just doesn't do it justice. This dish is amazing, despite how, well, un-pretty the photo turned out. We promise it's worth making! This would be a great side dish, especially at your holiday table. (Inspired by The Kitchen Paper). To cook the wild rice: Bring 4 cups water to boil in a saucepan. Add the rice and turn the heat down to a simmer. Cover and cook for 50-55 minutes. Drain the excess water and set aside. Meanwhile, prepare the other ingredients. In a large saute pan, heat the butter over medium heat. Add the onions and saute for 2 minutes, until softened. Add the mushrooms and cook for 3-5 minutes, until softened. Next, add the garlic, oregano and red pepper flakes. Season to taste with salt and pepper. 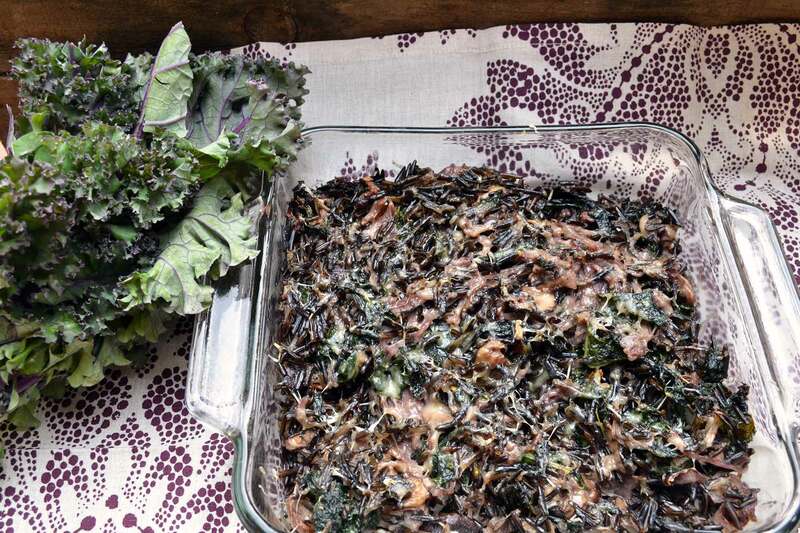 Put the torn kale leaves in next and cook for 1 minute or so, until they're wilted. Sprinkle the flour over the top and stir until incorporated. Pour in the broth and cream or milk and bring to a boil, stirring occasionally for 3 minutes. Add the cooked rice to the pan and stir to evenly mix. Pour the contents of the pan into a casserole pan and sprinkle the cheese over top. Cook for 20-25 minutes, until the cheese is golden and melted. Serve immediately!